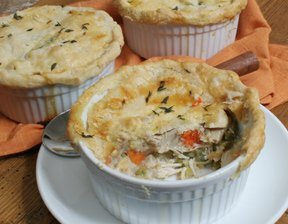 Tender chicken, fresh vegetables and a savory sauce baked in a flaky pastry crust – one of those perfect comfort foods. When the weather turns a little cooler we are all looking for recipes to help take the chill off. This is a perfect recipe to help you warm up this fall. Step-by-step instructions on how to make a double crusted pie to fill with your sweet or savory fall fillings. A crumb crust adds a different taste and texture to a pie. See what a simple alternative this is to a regular pie crust.